Cook presented the bizarre, malformed new product to stunned silence during a media event at Apple headquarters, revealing a device that, while vaguely similar to a computer in certain respects, appeared to be encased in a thick, flesh-like coating that was visibly moist and engorged. The hideous new device, which retails for $1,299. Shocked audience members claimed the appalling laptop, which seemed to many onlookers to have functioning digestive, muscular, and urinary systems, was “hard to look at” and easily the most repellent product yet manufactured by Apple. One customer, who had been anticipating the release of the new MacBook for months, claimed he felt “nauseous” when multiple software applications running at once caused the computer to start wheezing. 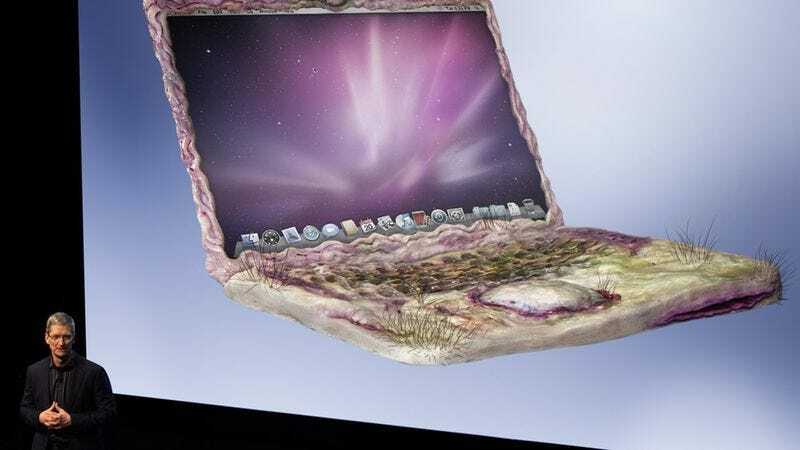 According to technical specifications released by Apple, the revolutionary laptop also features an advanced graphic display with a movable lid that protects the exposed screen from harmful dust particles or bacterial infections that can cause the monitor to cloud up and ooze a yellow, milky substance. Available in 13-, 15-, and 17-inch models, each MacBook contains a 2.4 GHz Intel Core 2 Duo processor, a battery capable of lasting eight to nine hours on a single charge, and a full-sized keyboard orifice filled with rows of buttons made from growing keratin. Apple sources confirmed Cook was disappointed by the intense scrutiny from the media, stockholders, and consumers, believing that he was following in his predecessor’s footsteps by attempting to push the technological envelope. Cook also assured consumers that the computer is fully compatible with the iLife suite of software applications. A group of users who tested beta versions of the horrendous new MacBook told reporters they were deeply disturbed when their products moaned to indicate a low battery and then snored gently when put to sleep. Brick also told reporters that his MacBook originally weighed five pounds, but ballooned up to 80 pounds during a two-week period when Brick was feeling depressed. He said eventually the computer began to quietly whimper, and tears streamed from the built-in speakers. As of press time, 3.2 million loyal customers were lining up overnight outside of Apple stores across the country for the chance to buy the slick new abomination.